Each iPad used for SwipedOn will have a unique, randomly generated Device ID created for it. This unique code allows you to login to the iPad application and gain access to SwipedOn. This code tethers the iPad to the Web Dashboard and each iPad must have it's own unique code to login. Using the same code on another iPad is possible, but it will automatically logout the original iPad. 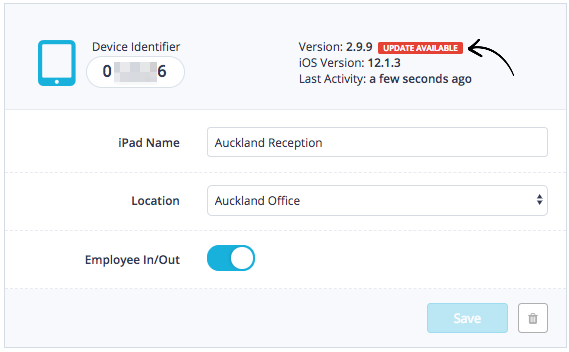 The Device ID can be found by navigating to the 'Settings' tab and clicking on 'iPads and Locations'. 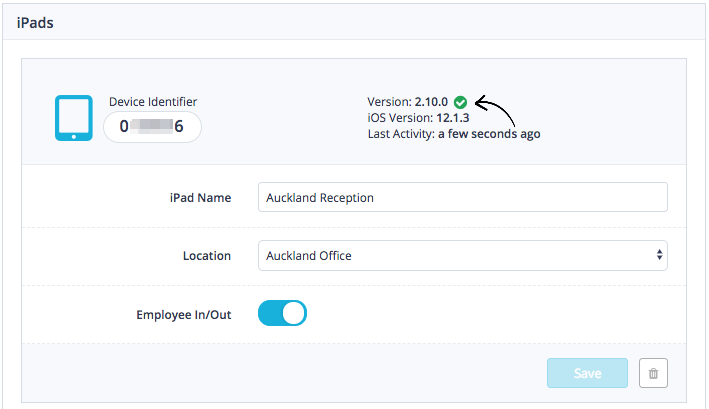 In the iPad box, along side the Device ID, you will also notice we display which version of SwipedOn each iPad is running and when the device was last active. Below you will see an example, when an update for the SwipedOn app is available, you will see this here in red, this can then be updated from the Apple app store. *Please find our help article on how to update your SwipedOn version if you require further assistance please get in touch with us via support@swipedon.com or using the live chat function in the lower left corner.